We've begun to receive initial holiday datapoints from industry observers and retailers. Last week, RetailNext reported total holiday sales increased 3.5% - 4.0%, while ShopperTrak reported a holiday sales increase of 4.6% (vs. expectations of +3.8%). Meanwhile, we've heard from several retailers, either through pre-announcements or through quarterly results. Many companies reported better-than-expected results and positive stock reactions. HGG and FDO's negative results raise the question of whether their trends are indicative of company-specific issues or a slowdown in consumer electronics and the lower-income consumer. Excluding these companies, it appears that holiday results may have benefited from several tailwinds. The widely reported drop in gas prices likely helped put extra money into consumers' pockets. 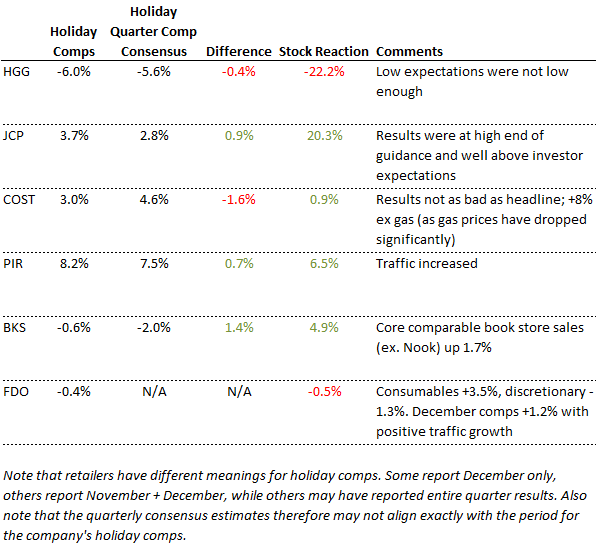 Additionally, 4Q comparisons were easier this Christmas as last year's results were impacted by disruptive snowstorms. While we only have a handful of data points so far, these tailwinds could bode well for retailers when they report 4Q results in the coming weeks.